The Colosseum, alternatively known as the Flavian Amphitheatre, is arguably Rome’s most well-known monument. The elliptical structure that spans 6 acres signifies the presence and importance of Roman Engineering, tying in multiple engineering concepts within its structure. After first seeing the Colosseum, I was immediately drawn to the repeated concrete arches lining the perimeter. Knowing that the Colosseum served as a ‍main source of entertainment for the people in the heart of the city, I was intrigued by the scale of the project and the vulgar practices that were seen as entertainment and power. The building itself once defined religion and culture for the Roman community. The striking appearance of the building was breathtaking and ‍I knew I wanted to study the Roman Empire’s largest amphitheater further. After viewing the exterior multiple times, taking an in-depth tour, then doing extensive literature and online research on the subject, I was able to learn and apply concepts about the history, construction, engineering, restoration, and modern-day use of the Roman Colosseum. The structure had to be planned wisely because its location was to be built where Nero’s manmade lake was held. 26-foot drains took out water from surrounding valleys while concrete doughnut-shaped foundations were placed under the outer walls and inner ellipse. Ground level was raised 23 feet out of the valley for the amphitheater to sit on. The amount of expertise that went into planning the project is one of the main contributors to why it is still standing today (Hopkins, n.d.). Construction began in 72 AD, financed by relics taken from the Jewish Temple after the ‍Great Jewish Revolt in 70 AD‍. The workforce consisted of 12,000 Jewish prisoners also taken from the Siege of Jerusalem. While the Jewish slaves were a source of unskilled labor, the Romans undertook more specialized jobs. Prisoners worked long, hard hours under harsh conditions, including transporting travertine building blocks from a quarry 20 miles away in Tivoli. The construction took eight years, a ‍considerably fast duration for having little equipment and being built on top of Nero’s lake. After Vespasian died in 79 AD, his son, Titus, took over and held the 100-day long inaugural games at the new Flavian Amphitheater‍ in 80 AD, sponsored by the Emperor, where animals and gladiators fought until death. Spectators came out each day and watched long hours of gladiatorial battles, among other shows. Inside the Colosseum, these battles were seen as extreme entertainment that symbolized supremacy of ‍the Roman community. 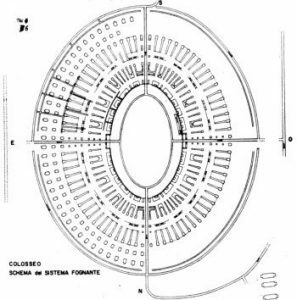 The complete structure, measuring 620×513’ and a capacity of more than 50,000 spectators (‍History.com, 2010), is shaped as an Amphitheatre, a shape created by the Romans by combining two semicircular theatres to make a continuous ellipse (Pepe, n.d.). The building aimed to provide various types of entertainment to serve the Roman community. Seats were arranged by social class – the Emperor had the best set in the house, while senators had the next best seats reserved for them. The architect, who is unknown, wanted to build with a ratio of 5:3, or 300×180 Roman feet. 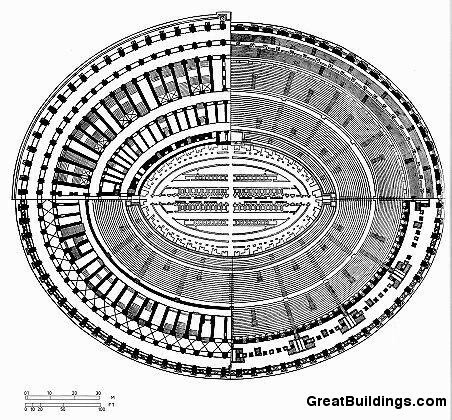 Symmetry showed that the width of the arena, width of the auditorium, and height of the external façade were all equal. The perimeter, 1,885 Roman feet, was important to design because 80 equal arches needed to line its entirety (Hopkins, n.d.). The Roman concepts of proportions and symmetry are found elsewhere throughout the building. 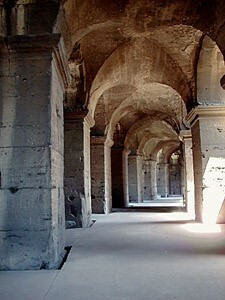 Roman engineering concepts, such as arches, columns, and vaults, are very common in the design as well. Below is a figure of the structure in plan view as it was built in 82 AD. The cavea made up the seating portion of the auditorium, structurally supported by vaults underneath. The first three rows, reserved for senators, were made of marble seats. The succeeding rows were made of travertine for normal spectators. Sections were divided vertically and seats were chosen by social class (Pepe, n.d.). In its earlier days, the most common battles were venationes (hunts of wild animals) and munera (gladiatorial games). The games were first strongly associated with religion and magic, but this connection came to a close as time went on. The most popular game were chariot hunts were held in the circus. Other practices that took place include re-enactments of famous battles, dramas based on mythology, and executions of condemned criminals. The games were regulated by laws and were driven by interest of the public. The last recorded gladiatorial game in the Colosseum was in 438 AD, when Valentinian III abolished these practices (Nero, n.d.). In the Medieval era, a small chapel was built and the arena was used as a cemetery. Later, spaces under the vaults were rented out as housing and workshops until the 12th century. After a major earthquake destroyed two-thirds of the building in 1349, the remaining third was taken over by a religious order until the 19th century, but otherwise the monument was neglected for a number of centuries. In the Modern era, the façade has been reinforced and restored multiple times and has become one of the most popular tourist attractions in the center of Rome, hosting tours to 4 million tourists each year (Wikipedia, n.d.). Originally, the amphitheater had the capability to transport water from the Aqua Claudia aqueduct, the city’s main water source, to flood the substructures and create navy battle scenes. 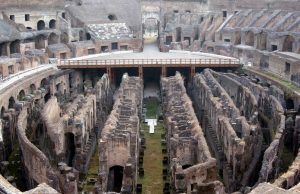 In later years, when Titus’ brother Domitian took power, ‍the hypogeum was excavated‍ to hold the fighters before the shows started, thus ending naval battles. Once the hypogeum was built, the construction of the entire structure was considered finalized. Many disasters have taken place over the years which have destroyed the structure, some worse than others. Though the amphitheater was abandoned for multiple centuries, and two-thirds of the structure was torn down, multiple restorations have taken place to keep the building standing and maintain its historical significance. Restorations are still in effect to this day. Refer to the “Building Restorations” section to learn more. The Amphitheatre was, and is, located in the heart of Rome, in between the Esquiline, Palatine and Caelian Hills. The structure was built where Nero once claimed his land and held his artificial lake. Because the Colosseum is the tallest ruin in Rome at 48 meters tall, it is hard to miss when you are in the neighborhood. I passed by the structure many times throughout my stay in Rome. When Domitian came to power, he made the effort to build the hypogeum in the basement of the Colosseum where the sewer system previously existed. The area consisted of two stories with chambers for gladiators, 32 cages for wild animals, shafts, and a pulley system. Vertical shafts had lifts for animals to be transported to the main stage as slaves were operating the pulleys (History.com, 2010). The Colosseum hosted many different types of events in a short period of time, so the hypogeum was structured to quickly transition from one type of show to the next. Roman engineers were responsible for providing an efficient network of mechanisms to allow for quick changes in special effects and fast hoisting of animals. For the largest animals, engineers created the hegmata, a strong platform which was hinged and could hold the weight of the animal, and could be hoisted with the animal to the stage. These were operated by slaves. There were multiple tunnels in the hypogeum leading to the outside of the Colosseum and to surrounding buildings, such as gladiatorial schools, stables, and the Spoliarium where weapons were kept and dead bodies were stripped. These tunnels made for easy transportation of fighters and leftover bodies from the gruesome games. The hypogeum was constantly changing to carry out the shows and contests more effectively with the latest Roman technology. Twelve different stages of construction are known for the development of the hypogeum ruins (Alchin, n.d.). Above shows the hypogeum ruins as it is seen today by tourists. The stage was torn down in disasters, and the hypogeum is currently viewable from the upper levels. Because the outdoor amphitheater made spectators uncomfortably hot on summer days, the Colosseum had a Velarium consisting of long fabric strips connected to ropes, hung from 240 masts set in sockets around the amphitheater. Marines went through training for years and were hired to operate the awning based on the weather. The process to raise and lower the awning was much like a sailboat (Bomgardner, n.d.). Above shows how the Velarium was attached to the structure at the sockets and supports. The Colosseum was designed so the amphitheater, at capacity, can be completely emptied out in five minutes. This shows that the design called for an abundance of entrances and exits, thus an abundance or arches that the crowd could quickly navigate through. The structural design accounted for efficiency in terms of functionality (UNRV, n.d.). The Romans used the new measurement concept of “standardized parts” when building the Colosseum. To efficiently build 50,000+ seats, the builders constructed stairs and seats off-site and made them all interchangeable at equal sizes. 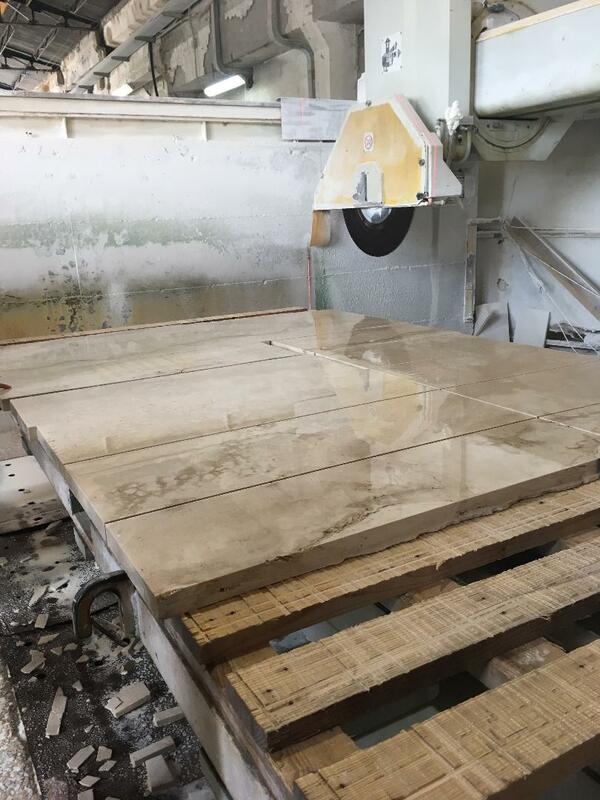 Experienced craftsmen built these parts in workshops then brought them to the job site. 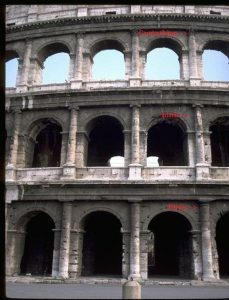 This reinforces the idea that the builders constructed the Colosseum in a skilled and efficient manner (Alchin, n.d.). Many materials were used for decorative and structural purposes to build the Colosseum in order to create a durable, long-lasting structure. However, I will adress the materials that were the most common in ancient Roman construction and the Colosseum. Tuff, a stone made by cementing volcanic ash ejected from an eruption, was used for other columns and radial walls. The Roman obtained tuff by volcanic eruptions. This was one of the Roman’s main building materials in the ancient era. Tiles and bricks, produced by mixing clay and water then drying in the sun, were placed in wall structures for roofing and filling. Roman bricks are flatter and longer than bricks that you generally see today. The most common size of Roman brick is 1.5 Roman feet by 1 Roman foot. 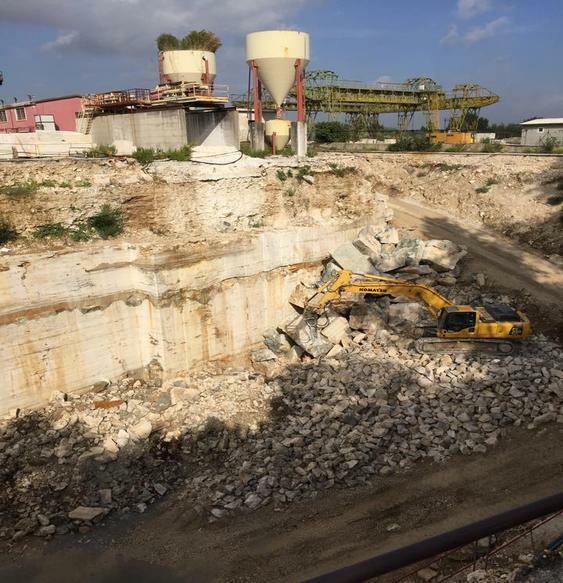 lime from lime production, and water (Muench, 2015). Roman concrete ‍was proven workable with its unique sticky paste containing volcanic ash and lime. Pozzolana enabled Romans to set the concrete quickly, allowing for fast construction of structures (History.com, 2010). The recent invention of Roman concrete allowed for fast and efficient construction which was done in a skilled manner. Lead and terra-cotta pipes were used for the water and sewer system existing under the structure (Alchin, n.d.). The Colosseum laid on top of a valley where Nero’s lake was located, and one of the main issues was drainage. To build the foundation for the amphitheater, massive drains were first built to drain the lake. The valley was then excavated until the clay bed was reached underneath the sand and silt, measuring 31 meters wide and 6 meters deep. The excavation was then occupied with Roman concrete compacted by hammers. The fill continued for another 6 meters above the excavation, because the structure was built above ground level. The foundation was reinforced with brick around its perimeter. Once the foundation was laid out, the construction of the amphitheater was ready to begin (Pepe, n.d.). According to M. Cerone of La Sapienza Rome (n.d.), “The foundations stand on a heterogeneous ground not completely known (and now under study) formed by recent Holocene alluvial deposits less compact and less resisting then the underneath Pliocene stratification. The reduced soil stiffness, not homogeneously distributed under the monument, is the cause of some first differential settlements, relative movements and the consequent increasing of local stresses”. The increased stresses in the foundation can account for the settlement and some of the damage of the structure over time, calling for many instances of restoration work. 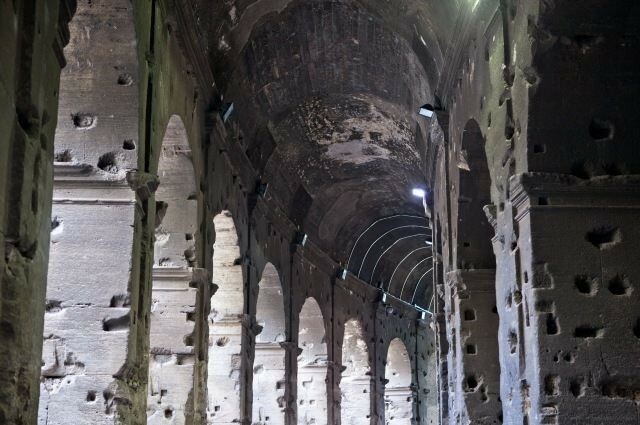 The construction of Rome’s underground metro system near the Colosseum has caused the strength of the foundation to decrease as well, also accounting for damage. 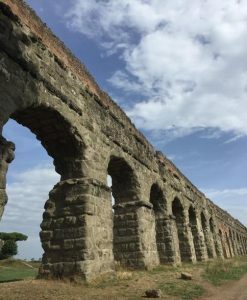 Ancient Roman buildings utilized arches because they allowed for large blocks of stone to be placed in a way that supports the structure and carries weight. This is arguably the most important architectural feature of the arena, surrounding the entire facade. The arch’s engineering purpose is to direct pressure down and out, creating compressive stress in the arch. 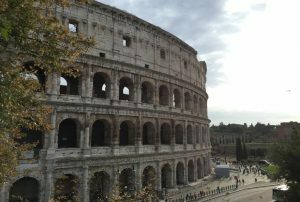 When the Colosseum was built, Roman concrete was a recent discovery which could support the weight of large scale structures, but the Romans were unsure of its lifespan. The builders combined Roman concrete with stone to build the arches to increase its strength (Alchin, n.d.). The Colosseum has 80 arches lining its perimeter, each 4.2 meters wide and 7.05 meters tall on the ground floor, and 6.45 meters tall on the upper floors with a total of four floors (Pepe, n.d.). Because the Colosseum’s arches are made of masonry, we can use the simplifying assumptions as taught in our Structures lecture: Masonry units are infinitely rigid and strong, they don’t slide at the joints, and tension is not transmitted at the joints (Muench, 2015). According to Thomas E. Boothby (n.d.), “the arch under dead load is generally considered to be a two-hinged arch, and the horizontal thrust is chosen as the redundant quantity and solved for by Castigliano’s theorem. For a two-hinged arch…under the influence of a significant concentrated load, the arch will develop a third hinge and become statically determinate.” We can therefore assume a 3-hinged arch with two at the abutments and one at the top of the arch. We solved for the reactions of a statically determinate arch in the Structures homework as well. Vaulted arches, like the exterior arches, were made of Roman concrete, which added strength to the building without adding much weight. Vaults were invented by the Romans by combining multiple arches for structural support. The ceilings of the passages and corridors on the exterior all had vaulted arches with supports made of durable limestone. Vaults made the ceiling much stronger than a flat ceiling and transferred weight from the arches down through the columns (Alchin, n.d.). To avoid collapsing, resistance to horizontal thrust must be present at the haunches. The Romans configured this by thickening the haunch walls with buttresses placed at areas of extreme horizontal thrust (The Columbia Electronic Encyclopedia, 2012). Barrel vaults were present on the first floor of the colosseum, lining the entire outer perimeter. Groined vaults were constructed in the interior of the structure (Pepe, n.d.). 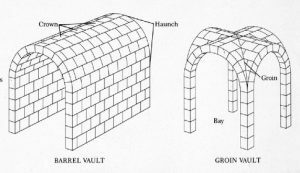 There are different types of vaults: barrel vaults which are normal arches but more deep and are wide enough to span the roof, groined vaults which are barrel vaults that intersect at 90 degree angles, and rib vaults. 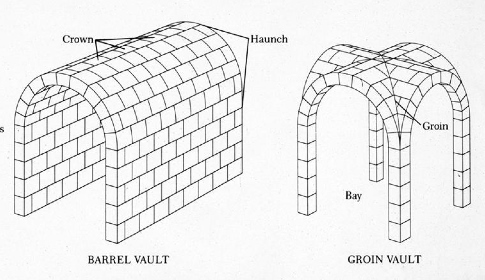 Below is a diagram depicting barrel versus groin vaults, then photos showing the actual vaults in the amphitheater. 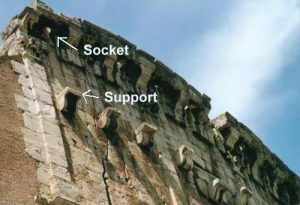 Ribbing was important in the vaults of the Colosseum, present in the arches of travertine arches, arches of bipedalis, and arches of bipedalis separated at the edges to fill with mortar and concrete (as ladder ribs). Ribbing was important “because four of the radial walls at ground level were each built directly onto the crown of one of the substructure vaults, the builders provided travertine ribs as reinforcement” (Lancaster, 2005). Ribbing dispersed weight from vault to vault rather than having it concentrated in one area, and was necessary to keep the building standing. Ribbing took more importance when the first major rebuild happened under Alexander Severus, when lattice ribs, ladder ribs built next to eachother, were introduced. According to Lynne C. Lancaster, “when the outer ambulatories on the north side of the building were rebuilt, lattice ribbing was used to replace bipedalis ribbing…The lattice ribs were performing the same function as the original bipedalis ribs, but they represent a later and more developed form of a rib”. Lattice ribbing were more efficient and therefore favorable for construction and restoring buildings. This shows that Romans were seeking methods of increasing efficiency and furthering engineering methods. Ribbing can be found in other ancient Roman buildings as well, such as the Pantheon and Baths of Caracalla, used as reinforcement. 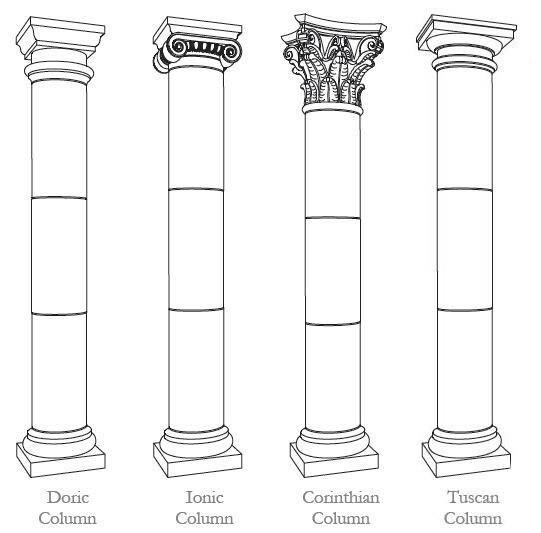 Above is an image depicting the types of columns contained in the Colosseum. In engineering analysis, columns are used to transmit a compressive load from above the column down through the bottom. In the Colosseum’s case, columns were used to transmit the weight of the structure to the ground while keeping the building standing. Columns were utilized both for structural purpose and for decoration. The first floor contained 23 foot Doric half columns, simple in appearance but designed to support the upper floors of the structure with its stocky body. They are designed to have round tops and no base. 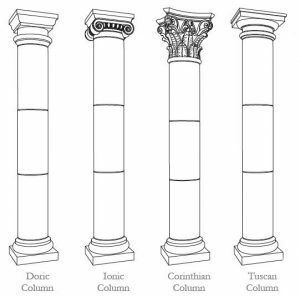 The second floor had 21 foot Ionic half columns which are more detailed than the Doric. With slender columns and large bases, they were used for structural purposes and decoration on the second floor. The third floor was lined with 21 foot Corinthian half columns which are the most ornate and are mainly used for decoration. They have slender, flute-like pillars and illustrative designs of leaves at the top. The fourth floor had no columns (Alchin, n.d.). The load on a given column can be determined by calculating the self weight of the structure in the tributary area corresponding to the column. Above is a diagram depicting the drainage system that operated during the Ancient era. A sewer system was necessary in the Colosseum because the mass amount of spectators needed water for various reasons: Drinking water, toilets, waste disposal, naval battle water disposal, and water for performance effects were all necessities. Rome had the amounts of water that was called for in many areas to operate the events. Evidence shows that the Colosseum had side towers with cisterns filled with water which were able to feed drinking fountains. The structure got its water supply from the Aqua Claudia and lead and terra-cotta pipes were installed in the walls. The caveas collected rainwater which poured into vertical pipes that lead to the first floor, then half flowed into the arena and half flowed outside due to the double incline design (Pepe, n.d.). The public toilets were constructed as latrines, or communal rows of holed seats where water flowed under the seats that lead to a large circular drain that connected to the Cloaca Maxima, the main sewer system of the city (Alchin, n.d.). Recently, there has been evidence depicting that runoff canals were constructed to drain the arena after it had been flooded for sea battles, sometimes five feet deep. The naval battles ended in the first century AD and Romans built masonry walls around the stage area to make flooding impossible, and naval battles came to a permanent close (Mueller, 2011). The Colosseum has been rebuilt and restored many times throughout its lifespan. First, Domitian built the hypogeum as an effort to stop damaging the structural framing by discontinuing naval battles. After the battles ended, major fires were the top contributors to restoration effects. The first fire came in contact with the wooden parts in the interior of the structure and burned it down. The first minor repair was made under Antoninus Pius after the first fire in the 2nd Century (Pepe, n.d.). Complete rebuilding didn’t start until the upper floor was caught on fire in a lightning storm, where embers lit the top wooden floor and the levels below is collapsed and tore down most of the amphitheater. The Colosseum took more than thirty years to reconstruct, led by Emperor Marcus Aurelius Antonius Augustus. It reopened in 222 AD under Alexander Sevarus and repairs were completed in 240 under Gordon III. During the reign of Gallienus, a major earthquake destroyed much of Rome and the Colosseum (Pepe, n.d.). Earthquakes in the 5th century caused damage in the Cavea, attic walls, and attic columns. Because the earthquakes caused the amphitheater to settle more on the South end than the North end, southern arcades were taken down for safety reasons, while the hypogeum was covered with earth. The building was neglected for much of the Middle Ages, so vegetation that grew in the wall cracks increased damage of the structure. Another earthquake in the 9th century increased damages in the arcades on the south-east side. In the 13th century, the Annibaldi replaced the porch by the eastern entrance (Cerone, n.d.). The most destructive earthquake took place in 1349 which caused the southern porches to collapse. This caused damage throughout the whole city. Subsequently, maintenance on the northern side was increased to maintain the structure. The last documented earthquake was in 1703 when two arches in the second ring collapsed and caused extensive damage to the structure. Restorations continued in the 19th century. Two buttresses, on the east and west sides, were made to support the outer portion. The southern side was rebuilt, and radial walls and vaults were built on the northern side to improve radial stability in the structure. In the 20th century, five damged columns in the third ring were reinforced (Cerone, n.d.). 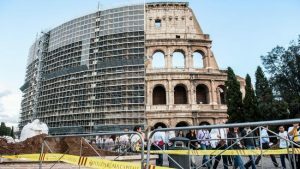 Presently, the Colosseum is undergoing a three-year restoration process to strengthen the building. Della Valle is financing the $33 million project that is divided up into three stages. First, the façade went through a deep cleaning, transitioning the stone from its current dark color to its original “white ochre” color, as we saw during our class trip. Second, a new visitor’s center will be built outside the arena. Lastly, the interior, such as the hypogeum, will be thoroughly cleaned and updated. This large-scale restoration project is scheduled to be completed in 2016 (CBS, n.d.). Below is a photo I took in September 2015 showing the restoration work on the exterior. The Colosseum hosts 4 million tourists per year, making it the 39th most visited place in the world (Wikipedia, n.d.). With the hypogeum recently opening for tours in 2012 and a $33 million restoration project in progress, the Flavian Amphitheatre is likely to be a tourist hotspot for the next 2000 years. The historical amphitheater commonly known around the world. The immense amount of history that is contained in this structure makes this destination a meaningful visit that leaves a lasting impact. Prior to studying abroad in Rome, the Colosseum was the monument I was the most excited about seeing. Generally, when I think about the city of Rome, I immediately picture the Colosseum. It wasn’t until I arrived and first walked by the amphitheater that I knew I wanted to do my project on this particular structure. 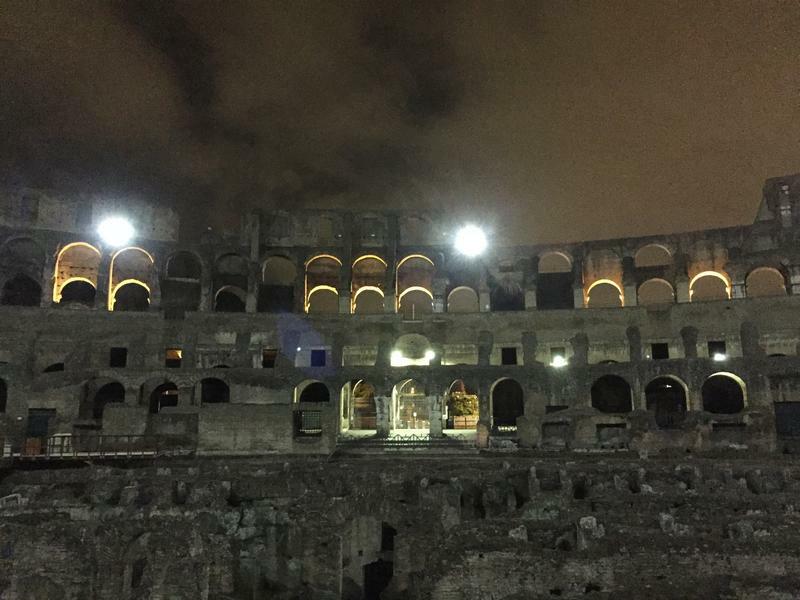 I had the opportunity to tour the Colosseum at night with Engineering Rome during the program. The night tour offered less crowds, a private tour, and incredible views under the moonlight that can’t be seen in photos or during the day. Seeing the structure at night was more relaxing than having to make my way through hundreds of tourists during the day, so I was able to enjoy my experience and stop to think about the parts of the building more. Prior to visiting the monument, I didn’t know what to expect. I was not aware how huge the amphitheater actually was and the amount of people it could hold. Though much of its framing has been destroyed over years from fires or earthquakes, much of it is still standing or has been replaced for the viewer to see, so I could really picture the events that took place in the ancient era. Our tour guide led us to all stories of the building, explaining the process of the games, the layout of the building, and the history behind its construction. He then took us into the hypogeum, only recently opened for tourists, and I was surprised that it spanned the entire basement of the arena. I was mostly intrigued by the pulley system that was operated by slaves to hoist animals into the fighting area. I was taken aback that the Romans were able to configure a system that could move extremely heavy animals from the basement to the ground floor. The fact that gladiators and animals fought to death, and 50,000 people came to watch this for entertainment really resonated with me because these practices are seen as inhumane and cruel today. 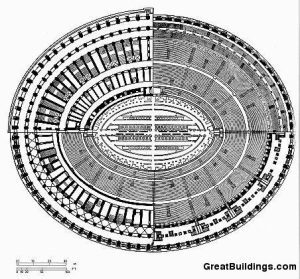 I was intrigued by the idea that our ideals today differ so much from when the Colosseum held games and shows. Apart from this, the structure itself is unlike any other with arches and columns viewable on the entire exterior façade. I was taken away by the fact that the Romans, with little engineering knowledge, were able to build a 6-acre amphitheater that still stands 2,000 years later. I was curious as to how the structure has changed and shaped to be what it is today from an engineering perspective. Because the monument is the largest in Rome, the size of the structure with its remarkable appearance made me choose the Colosseum to study. The Colosseum is a complex structure that represents the wealth and power of ancient Rome. This structure is one of the most important monuments in the world because this stood as the center of the Roman Empire, both literally and figuratively. People from all around the world came to this magnificent amphitheater to witness what they saw as power, and the games that were held here defined culture at that time. The Colosseum shows that the Roman Empire was flourishing in wealth and were able to sell out multiple shows every day. Aside from its historical significance, the Colosseum contains the earliest Roman engineering and building techniques. From an engineering perspective, the amphitheater is favorable to analyze its structural changes in the past 2000 years. The Colosseum, an imposing historical landmark, epitomizes early Roman engineering and prosperity of ancient Rome, which makes it the ideal project topic. Aelius, Stilo. “The Colosseum.” Colosseum. N.p., n.d. Web. 16 Sept. 2015. Alchin, Linda. “Roman Empire & Colosseum.” Roman Colosseum. Siteseen Ltd., 2015. Web. 16 Sept. 2015. 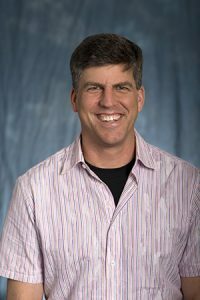 Boothby, Thomas E. “Analysis of Masonry Arches and Vaults.” Progress in Structural Engineering and Materials Prog. Struct. Eng Mater.3.3 (2001): 246-56. Web. 16 Sept. 2015. Cartwright, Mark. “Colosseum.” Ancient History Encyclopedia. N.p., 6 Nov. 2012. Web. 1 Dec. 2015. Cerone, M., G. Groci, and A. Viskovic. 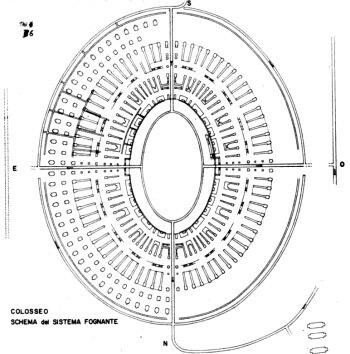 “The Structural Behaviour of Colosseum Over the Centuries.” (n.d.): n. pag. Web. 16 Sept. 2015. “Colosseum.” History.com. A&E Television Networks, 2009. Web. 16 Sept. 2015. “Colosseum Restoration Begins in Rome after 3-year Delay.” CBSNews. CBS Interactive, 5 Dec. 2013. Web. 16 Sept. 2015. “Colosseum Underground Tours Extend Opening Dates and Allows Independent Visits.” Walks of Italy. Walks of Italy, 2 June 2014. Web. 16 Sept. 2015. “The Great Revolt.” Ancient Jewish History. N.p., n.d. Web. 1 Dec. 2015. Lancaster, Lynne C. Concrete Vaulted Construction in Imperial Rome: Innovations in Context. Cambridge, UK: Cambridge UP, 2005. Print. Mueller, Tom. “Secrets of the Colosseum.” Smithsonian. N.p., Jan. 2011. Web. 16 Sept. 2015. Muench, Steve. “Structures Lecture.” Engineering Rome Wikispaces. N.p., n.d. Web. 16 Sept. 2015. Pepe, Andrea. “The Roman Colosseum.” The-Colosseum.net. N.p., n.d. Web. 16 Sept. 2015. 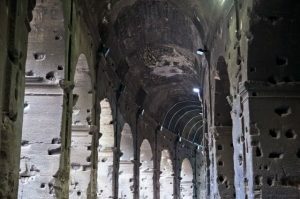 “Rome’s Colosseum Unveils Its Underworld.” History.com. N.p., 2010. Web. 16 Sept. 2015. Valentine, John. “Natural Stone Columns in the Classical Order of Architecture.” AJ Brauer Stone. N.p., 19 Dec. 2013. Web. 16 Sept. 2015. “Vault: Engineering Considerations.” The Columbia Electronic Encyclopedia. The Columbia Electronic Encyclopedia, 2012. Web. 16 Sept. 2015.